One day I got very sick of maintaining samples of my 300 fonts by hand. So I wrote this. I'm anticipating great rewards when it comes time to pick the perfect font for the titles in my next iMovie. 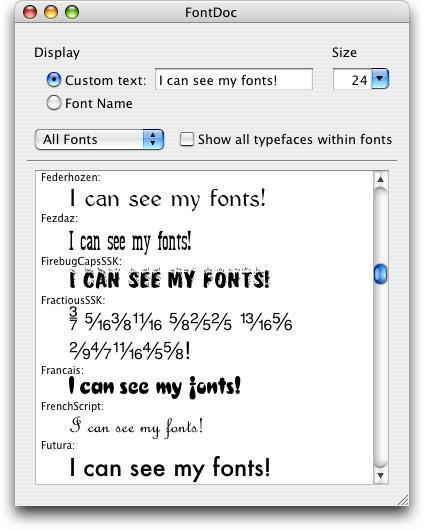 The document this program produces is a plain old Rich Text document full of all your fonts. Save it, print it, or just gaze at it rapturously. Whatever. The possibilities are undoubtedly endless. Hopefully FontDoc will be rendered obsolete by something in a future version of Font Book. Until then, it's yours, dear denizens of Macdom. Requires Mac OS X 10.2 or later. Report problems: Corrupted fonts may crash the Apple code upon which FontDoc relies. If you are experiencing problems, please use Font Book to validate your fonts. You should also try clearing the font cache. If you still can't fix it, please contact me. I want to fix problems, but I can only do that if you tell me about them. FontDoc is free. Of course, thank-you gifts are gladly accepted. FontDoc remembers your scroll position when it updates its document display.